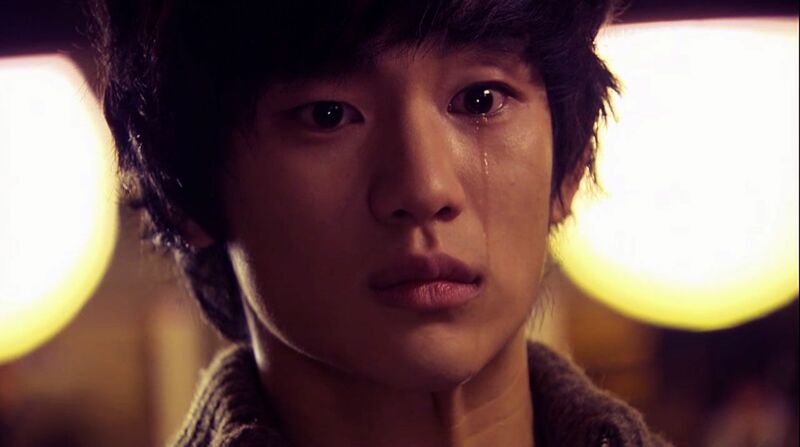 Final Thoughts on Dream High. ~_~ It's always like this. I'm always like this. When I fall in love with a drama, I just can't help but to be so emotionally attached to it and by the time that it has to end, I will go through the pains of drama withdrawal syndrome. It's hard and I still don't learn. How can I change myself for the better? Someone needs to tell me how to easily move on from these dramas. They're supposed to be fun but when it's affecting your real life already........... it's just bad. I will mostly talk about my lovely couple, Sam Dong and Hye Mi. Although the drama is about six kids achieving their own dreams but I don't deny that the main reason why I am so attached to this drama is because of how Sam Dong and Hye Mi's story is laid out. Looking back to all the episodes as I'm writing this post made me realized that this part and Director's Jung's words were already a foreshadow of a long winding road for Sam Dong and Hye Mi. It was a love at first sight for Sam Dong however in Hye Mi's case, she needed Sam Dong for her own benefit. Sam Dong made his way to Seoul, attended an art school, all because of one girl he just couldn't get out of his mind. Hye Mi, on the other hand, only treated the boy no more than a person whom she just needed to get acquainted with for the reason that she has to get into that art school. Hye Mi has alot of things going on in her mind. Her lost dream, how to get through her painful school life, her undeniably attraction to Jin Guk, a childhood friend while there's Sam Dong, who's just always behind Hye Mi, watching things over for her, protecting her even though she doesn't see him. This conversation between Jin Guk and Sam Dong show you the line that is separating Sam Dong and Hye Mi. He is still far from reaching Hye Mi. The moment Jin Guk chose to chase after his dream and leave everything behind including Hye Mi opened so much opportunities for Sam Dong. It's like the time has already passed Jin Guk and Hye Mi by and that, it can never go back. Sam Dong has seen her smile. Sam Dong has seen her cry. I thought that was such a big step in the ‘relationship’ they have now. It feels like, it has finally stepped out of the “I became close to you because I needed you to go to Kirin High” relationship. Hye Mi can openly cry and smile in front of Sam Dong. She’s showing him her genuine feelings. She is slowly… gradually opening up to him. In the 200 days that have passed, Hye Mi has got herself busy chasing for her dream. Hye Mi is changing. She learns to work hard, she starts to care for others, she knows how to joke around, she smiles genuinely, she knows how to be happy for someone's success, she listens. As she was going through all these changes, Sam Dong was there with her. It had been always the two of them all the time. The friendship gets deeper the closer they get. Jin Guk, then, came back and managed to clear the misunderstandings between him and Hye Mi. My heart was sinking down with Sam Dong's as he was forced to face the reality he's been trying to avoid. He's aware of Hye Mi and Jin Guk's mutual feelings for each other but keeps on denying it until it happened right before his eyes. The only reason why he's in Seoul trying out the best things in life, his only dream is slipping away from him. We weren't shown what happened between Jin Guk and Hye Mi after they've shared their kiss as Hye Mi was overwhelmed with anxiety as to what suddenly happened to Sam Dong. Sam Dong is different. Sam Dong has changed. Something was wrong with Sam Dong. Her mind is filled with all these curiosity and anxiousness about Sam Dong's sudden change. The Sam Dong who only knew how to cater to her now yelled at her, tossed her hand away and regretted his decision of following her to Seoul. Despite not knowing the whole reason of his change, she assured herself that she will help her out, pull him out of his misery just like what he did before to her. Although this may surely be taken an act from a friend to a friend, we can see subtle changes to Hye Mi and her feelings. Because of her constant worry for Sam Dong, he is starting to take up her whole self without knowing. Finding out Sam Dong's illness was a painful road for Hye Mi. She didn't know what to do, how to cope up with it, nor how to help him. However, she stood strong by her words and did everything to pull Sam Dong out of his misery. This scene was just one of the most memorable in Dream High. There was so much in emotions in this scene that I always end up in tears whenever I replay it. This just shows how much Sam Dong and Hye Mi went through together throughout the series. They were always there for each other, pulling each other out from miseries and pains. They were there when both had their worst and their best. They grew together. It had been always just the two of them. It's like they already had built a world of their own. Even after finding out that Sam Dong's ear problems weren't because of saving her from danger, Hye Mi still finds herself helping out and worrying for Sam Dong. The way she acts around Sam Dong is starting to go beyond someone could give to a friend. It didn't even cross her mind that maybe... just maybe Sam Dong has been slowly... making his way through her heart until she was confronted with it. The moment Hye Mi asked Pil Suk how is it like to "like" someone is already a hint that this girl doesn't have a clue of liking someone to a different level. When Jin Man told her the good news of Jin Guk and Sam Dong finally debuting, her smile was so wide that she wanted to hurry up and tell on the good news. However when Jin Man stopped her and asked her, "Who are you going to?" Hye Mi excitedly answered... "Who else? Of course to......" And then it hit her! All this time, Sam Dong is occupying her mind, that she is overthinking about Sam Dong when she didn't really have to. Hence by the end of Episode 14, she muttered, "I must be crazy." Hye Mi having feelings for Sam Dong shouldn't be that surprised for the viewers nor should anyone think that everything is being rushed up. The writer has been putting this and that to each episode, slowly building up a possible love story between these two. It's too subtle to notice but if taken the time to do so, you`ll see what the writer is trying to point out. Everything has been laid out; it's just waiting for Hye Mi to get a knock on her head to see that things around her has changed even the one she's been treating as only friendship. Sam Dong, unbeknown to her, has slowly making his way through her heart. Friends in real life can fall in love with each other. Some didn't even know it's been always there until it hit them. It's the same case with Hye Mi and Sam Dong. Friends turning into lovers. I don't know from when did it start. And I only knew it now. This is why I love this song so much. It says a lot about Hye Mi's feelings about Sam Dong. It's a love that came late. She didn't know it was already there until it hit her; until she had to choose; until someone opened her to this new feeling. Jin Guk and Hye Mi had their fair share of time. Hye Mi and Jin Guk obviously had mutual feelings for each other. However, like I said previously, their opportunity slipped away the moment Jin Guk chased his own dream. He might have cleared the misunderstandings and Hye Mi forgave him but he can never turn back the time. He already lost his time when Sam Dong and Hye Mi spent the days, weeks, months together. The kiss on the Ferris wheel proved that. While it surely made them closer, it also grew them apart. Close, in a sense, that their relationship is indeed special. It's something you cannot easily toss away. Grew apart, in a sense, that Jin Guk is not the only guy anymore in Hye Mi's eyes. Even he, himself, noticed that. Hye Mi's field of vision has Sam Dong in it regardless whether a viewer interprets that as friendship or not. The fact that Jin Guk is sharing this "field of vision" with Sam Dong shows you that time really did impact his relationship with Hye Mi. This line from Baek Hee says it all. Jin Guk's feelings for Hye Mi is unwavering. He always makes sure people around him know that he only has eyes for Hye Mi. However, Hye Mi never did that to Sam Dong. Although she's aware of his feelings, never did she flatly turn him down, telling him that his feeling for her won't go anywhere. This is the difference between Jin Guk-Baek Hee and Hye Mi-Sam Dong. Although Hye Mi liked Jin Guk, she was still letting Sam Dong to be close to her, protecting her in shadows. She didn't draw any lines between them. The moment Hye Mi wavered, I already knew that Jin Guk isn't her "the one". If she liked him that bad, her feelings should have be stationed. Immovable. As for the ending, well, I'm very satisfied. Episode 15 already made me happy contented, love story wise, so I should not ask for more. The kiss scene at the end was like a bonus for me as a SamMi fan who stick with them from the start till the end :P Regardless of how they feel for each other, at the end of the day, these two were still young. They were only 17 years old back then and so many opportunities were awaiting for them. I'm glad that they both chose to chase their dreams before anything else. They were able to let go of each other because there's trust in the relationship. They believe in each other. That's all that matters. It's as if they already left it to fate as to when, how and where they will meet again. As Spiderman tagline says, With great power comes great responsibility. And it's true. The higher you soar, the harder the tasks and problems you need to encounter. Sam Dong and Hye Mi both chose to go after their dreams. They were able to attain higher achievements but in exchange for that was that they couldn't be there for each other physically. They will always reminisce the days they were together but that's all there is to it for now. I'm glad it ended that way. It's a feeling of not knowing what lies ahead. Their future is still left unwritten regardless of the time jump. Hye Mi and Sam Dong for now can only emotionally support each other. 7 years had passed and it's obvious that their feelings for each other are still that strong and unwavering... waiting for that one day they will be reunited again. Such a wonderful song. We were first introduced with this song in Episode 3 but who would have thought that this would bring so much impact on Sam Dong and Hye Mi. This was the song "ONLY" Sam Dong and Hye Mi shared together. No one heard Hye Mi sang this song but Sam Dong. No one knew the reason behind this song but these two. They are connected through this song. This song says a lot to what they have been 7 years later. Onto my second favourite couple! The only sure thing in this drama! MILKY COUPLE. Seriously I just love watching them together. They're so cute. Their story showed what typical highschool love life should be. It reminded me of my high school life ^_^ By the end of the episode, Pil Suk has gained weight again. I actually liked how the writer made her gain weight again. Pil Suk clearly said that she loved her old self. She didn't hate it so there should not be any reason why she'd be embarrassed by it. Pil Suk lost weight to prove something to herself. Skinny or not, she loves herself. Also, there's Jason who loves and adores her no matter what. That's all that matters. Overall, this is the best 2011 drama so far for me. It brought me so much laughter, tears, squeaaaal and lesson. Sure, it sure had tons of flaws especially acting wise but I'd rather choose a bunch of amateur actors with great storyline than A+ actors with sucky storyline (cough,MARRYSTAYEDALLNIGHT,cough). Heaven knows how much I love Geun Suk and Geun Young. I so anticipated their drama but it was just all hype. There was no story at all and I just needed to let it go. A+ actors don't necessarily mean the drama is going to be the best. It's already proven alot of times. No matter how good you are in acting if there's no story at all, the viewers will still be unable to connect with you. Dream High was a drama with amateur actors but it surely didn't become a hindrance in becoming a successful and wonderful drama. The storyline made these actors watchable and enjoyable. I will miss you so much Dream High.